“Passion, Protection and Preservation for the environment” inspire my work. Using technical processes developed from both my time at Winchester School of Art and my current artists practice, I try where possible to up-cycle or use found objects, giving previously discarded products of our society a new meaning and life. The step in stone project reflects the ethos of my artwork, being a project based in the environment, not far from my home and one which I drive through weekly. This project has given me the opportunity to learn more about an area I was not familiar with, its landscape, heritage and community. It has also been a chance to both develop new ideas and progress previous ones on a larger scale alongside other artists. Part of my reasoning for applying for step in stone was the challenge of developing previous smaller pieces of work in large scale to meet the huge industrial size of the working and disused quarries featured in the project. The contrast of the hard, straight geometric lines of the limestone against the organic soft shapes of my felted work intrigued me. Taking inspiration from two heritages from the area, the working and disused quarries and the long standing and continuing sheep industry, I wanted to combine the two. An installation of felted balls in a range of colours and sizes threaded onto steel rods. The felted balls, made using the age old method of wet felting from wools of the local area, have been made as part of InspirED workshops held at SESC. The wool has been washed/scoured, carded and felted. The colours reflect the rock strata of the quarries whilst the shapes contrast against the geometric hard lines of cut stone. Large felted stone and a collection of smaller felted stones. Taking inspiration from the industrial sized quarried stones in situ, I wanted to try and felt round one of these stones. Using a paper template to measure the area of the stone, various felting techniques were used to cover the stone. Wools from the local area were used in its raw/washed and carded/uncarded state. The layer of felt highlights the need to protect and preserve the large scale natural beauty. The collection of smaller stones were donated by Westdown Quarry. Round, organic balls placed on an island in the quarry. 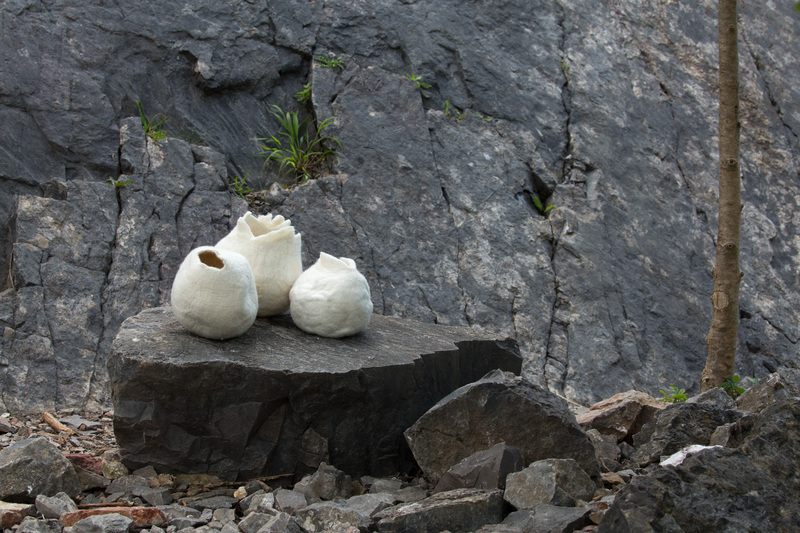 The “collection” of balls, all felted from local white wool, represent a direct contrast to the hard, solid straight lines of the quarry walls in their shape and colour. In some of the balls I have experimented allowing rust found in the quarry to “bleed” into the white wool, mimicking the leaching of minerals and colours within the quarry. An installation highlighting; Rusty remnants from the past heritage of industry from Westdown Quarry “tied” in with the heritage of the past and present wool industry of the local area. Rust Prints; Linking in with the previous exhibit, rusty “fragments” have been used to “print” records of walks and finds in the quarry on silk and cotton.